I never thought that fashion could be such an influence in our lives. According to George Simmel we all experience fashion thought a small group that sets the trend. We scramble to imitate that trend, no matter how expensive it maybe. In fact the more expensive, the more we have to have it. Interestingly, money doesn’t drive one away from following the latest fashion. As fashion is consumed by everyone, only then do we tend to withdraw. Which causes the demise of that trend. And then, and only then do we look for the newest fashion. Gender inequality Mrs. Gillman spoke about in the 1980’s was astonishing with women making up half the world’s population and being overworked and underpaid. Overworked having jobs in and out of the home. Not being reimbursed or respected for the job of keeping a household together. Underpaid in the workforce out side the home, even while having the same qualification and education level, where is the justice. Men try and be successful at work and running tight a household, I think some things would change quickly. I have just decided I would share some videos that I really enjoyed. Just bringing the video back to class discussion: If we consider popular movies like The Purge which are based on the notion that humans are animalistic, then we can easily accept the plot portrayed in the movie. But what if we challenge this notion that humans are inherently violent and selfish that has been perpetuated with the notion that humans do not want to be violent but want to seek out fulfilling relationships that are filled with love? Linked above is an amazing video that a close friend shared with me. This video sheds so much perspective on the larger picture that we deal with as students studying sociology. The purpose that sociology serves is not only to reconcile the present state of affairs with history, but to also work to help shift the current ethos, raising our awareness the power of our agency, as well as to inspire us to be critical of the energy that we create in the world. I would highly recommend this video! Blog #5: Gentrification, A new form of Colonization? As stated before, I love Franz Fanon’s work, lol, So I decided to share an article that I read long before learning about him. Hearing about colonization, this article came to mind. Gentrification is running Rapid in our communities here in the city. Linked above you will find a great article that visually illustrates what happens when gentrification is on the come up. 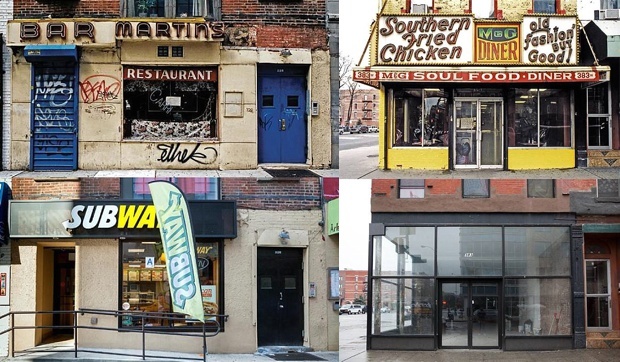 We see store fronts of mom and pop shops turned into sub-ways or upscale cafe’s. While these look really pretty and from an orthodox point of view they seem to be beneficial for the community: ITS NOT. Now, who wouldn’t be excited to see a nice Whole Foods in their neighborhood? Well a nice whole foods comes at a price. The arrival of this whole foods is the start of a battle for resources: families in the surrounding area, if not granted rent control or are fortunate to own a house, these families can be priced out of their communities, forced to move often at a short moments notice. We see traditional mom-and pop shops in the area going out of business because the new group of residents that are able to afford the new housing prices are not shopping at smaller shops but traveling to larger malls. Here we see that the money is not being circulated back into the community. We also observe a slow move away from the culture of the original community; while families are forced to move, they take their culture with them, or if they are able to stay new residents will not appreciate the cultural practices, such as a traditional drum circle, or the weekly block parties during the summer. While these elements of the neighborhood cease to exist we end up with a community that is void of originality, it becomes homogeneous in terms of the people that inhabit the area and the visual appeal of the neighborhood. Now to relate all of this to Fanon: how can colonization even be compared to gentrification? Well, if we think about colonization as simply as the take over of resources and land, this is exactly what we see happening in urban neighborhoods. With the neoliberal ideals that we seemingly accept, gentrification may not seem like a problem, but it leads to the people being removed from where they are for the greater economic gain. Once these people are priced out of their neighborhoods, where do these people go? What will happen to the culture? How is one to navigate the world when they have to be uprooted and adjust to a new reality that they have to face in which once has to realize that the space that they occupy is not their own? With all of these questions, how can we prevent gentrification, or perhaps prevent individuals from facing psychological hardships that result from displacement? Working in the south bronx and speaking with local organizations one of the ideas that an organization has implemented was to create an after school program for mothers in which they will watch children and provide free food as many of the mothers have to work long hours and do not have the opportunity to watch their children after school. This model creates a huge relief for working families in that they do not have to worry about their children. What other initiatives would you implement to alleviate some of immediate hardships that families will have to face if they are priced out of their homes due to gentrification?